3.8 out of 5 based on 49 bloggers and 8 commenters. Diapason is a free blogger template adapted from WordPress with 3 columns, left and right sidebars, fresh look, ads ready, slider, social bookmarking icons, posts thumbnails, tabs, drop down menu, gradients and vectorial elements. Jestem 14 letnią dziewczyną. Mieszkam w Polsce. Możecie na mnie mówić Rose, jednak nie tak mam na imię. Interesuje się fotografią, dekorowaniem wnętrz, modą jak i różnego rodzaju makijażami. I’m not sure how to edit the slider. Can anyone help? Hello, I would like to know how do i just keep the Slider for homepage. Whenever i add something on pages, the Slider stays there. So, I would like to know how do i keep it for the homepage only. 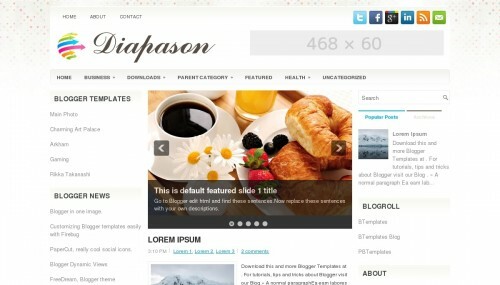 I’m using Diapason template to my blog (sivaniskitchen.blogspot.com). the home page looks absoultely fabulos. However, I have a problem with Comment Box in the single post page. The same post is shown as 3 comments. I observed this problem for almost all the posts. Please help me to remove the repeated post content as comments in the comment box, your help in highly appreciated. merci beaucoup pour le module. I am using this blog template .How do i change the blog title color and increase the width of the menu bar? I’m not too sure how to edit the sliders to have my own posts in it. could you please tell me how to do so?